Freediving Explained is the world's largest and most comprehensive FREE online freediving manual. Here you will find everything you want to know about freediving, from explanations about the various pieces of equipment used in freediving, freediving physiology and philosophy and breathholding techniques to various freediving training methods. Use the menu at the right hand side of this page in order to browse through the different chapters in the manual. Apnea - What is it ?The word apnea comes from the Greek phrase "a-pnoia" - 'without breathing'. Taken literally, the word apnea has no reference to the aquatic, however in current terminology it is used to refer to the sport of freediving: immersion underwater without the aid of respiration. Regardless to what draws one into the practice of Apnea (Freediving), it is a form of deep meditation which leads to a positive change in ones awareness of oneself and his surrounding environment and in ones ability to concentrate. Freediving leads to a better physical and mental condition of those who practice it. So who is a freediver ?Many people practice freediving without realizing it! A freediver is Anyone who holds his breath and is immersed in water; from a person who plays with the fish at the depth of two meters to the person who descends to a depth of two hundred meters using a sled, as long as your holding your breath underwaterand enjoying it, you are a freediver. In order to feel comfortable while freediving it is important to know the various pieces of equipment that are being used and the proper way to use them. This article will examine the essential equipment used in freediving, its purpose and operation. The snorkel is a hollow tube usually made out of silicon, rubber or plastic. It operates as an extension of your respiratory system, allowing you to breath freely while your face is immersed in water. The mouthpiece (the lower black part) is inserted in the mouth while the upper part (with the red mark) stays out of the water, the tube itself is being firmly attached to the strap of the mask. A snorkel that is made out of rubber or super flexible silicone is recommended for freediving - it can be easily folded and held in the palm of your hand - this reduces the amount of drag created when moving underwater. Water sometimes enters the tube, when this happens one should exhale forcefully through the mouth - this will force the water out of the tube thus clearing it. The mask enables the freediver to see clearly his underwater environment by creating an air space between the eyes and the water. A freediving mask must have a nose pocket so that the air space can be compensated during the dive (see Equalization). A low volume mask is recommended for freediving because less air is needed in order to compensate the air space in it. You can tell a low volume mask from other masks by the distance of the nose pocket from the lenses - the lower the volume the further the edge of the nose pocket is from the lenses. Water sometimes enters the mask, in order to force the water out of the mask without taking it off, one should put both of his index fingers on the top part of both lens frames and exhale forcefully from his nose while looking upwards. 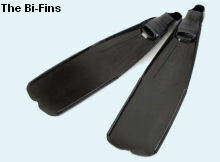 The freediving fins operate as extensions of the freedivers legs. Freediving fins are generally much longer and stiffer then swimming and scuba diving fins in order to move water with greater efficiency. Freediving fins are made of polymer (plastic), Glass fiber or Carbon fiber. Especially when first starting to use long bi-fins the leg muscles might cramp because of the great amount of effort needed to move with the fins, this is normal, when the muscle on the lower part of the leg cramps one should grab the edge of the fin and pull it towards the torso, when the muscles in the thigh area cramp one should grab the edge of the fin and pull it backwards towards the back. The weight belt carries the weights needed to counterweigh the positive buoyancy of the wetsuit. The amount of weights should be adjusted so that at the depth of -10 meters the freediver is neutrally buoyant. A freediving weight belt should ideally be made out of rubber. Nylon weight belts, which are very commonly used in scuba diving tend to swirl and move during the descend when freediving, this can lead to loss of concentration and control over movement. Rubber weight belts stick firmly to the body and do not move during the descend. The weight belt is worn on the waist rather then on the stomach as in scuba diving, this is done in order to be able to breath more easily. The freediving wetsuit is the freediver's second skin, it keeps the body warm while in the water. A freediving wetsuit should ideally be made out of open cell material (which sticks to the skin and limits the circulation of water between the skin and the suit) and in 2 parts; long trousers and a jacket with a beaver tail and hood (no zippers). Scuba suits are not suitable for freediving, water circulates quite freely in them, which is fine if your body is constantly on the move, this generates heat and keeps the water warm. However in freediving one tries to move as little as possible between dives and therefore a better insulation is needed. Most manufacturers who make open cell suits offer tailor made suits - these are highly recommended - they fit best. The dive socks ease the fraction between the freedivers feet and the bi-fin's (usually very unpleasant) rubber foot pockets. The dive sock also prevents cramps in the feet by keeping them warm. It is known that wearing a sock causes a slight loss of energy transfer from the legs to the fins. This however is not a very big loss and most freedivers use socks with bi-fins. Freediving socks should ideally be made of open cell neoprene material - this sticks to the skin and limits the circulation of water thus keeping the foot warmer for a much longer period of time without the need of moving the foot in order to generate heat.